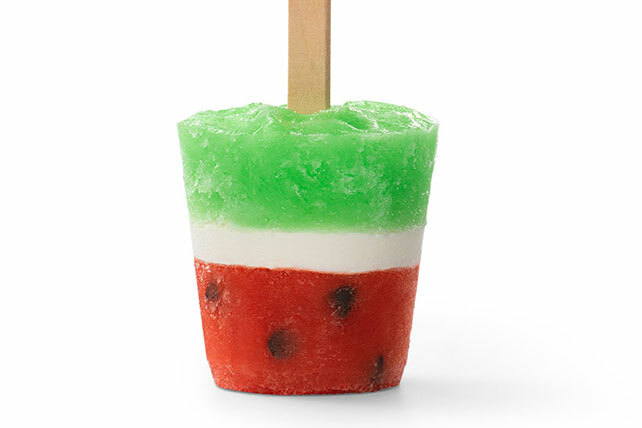 Start summer with a giant splash with these adorable Watermelon Popsicles. JELL-O Gelatin pairs with a cool, creamy center for delish on a stick. Combine 1/3 cup sugar and dry lime gelatin mix in medium bowl. Add 1 cup boiling water; stir 2 min. until completely dissolved. Add enough ice to 1/2 cup cold water to measure 3/4 cup. Add to lime gelatin; stir until ice is completely melted. Refrigerate 25 min. Meanwhile, repeat Step 1 using strawberry gelatin mix but omitting the refrigerating step. Pour into 16 (3-oz.) paper cups. Freeze 20 min. Stir 1/2 tsp. chocolate chips into gelatin in each cup. Beat cream cheese and remaining sugar with mixer in medium bowl until blended. Stir in COOL WHIP; spoon over gelatin in cups. Pour lime gelatin over cream cheese mixture. Insert wooden pop stick into center of each cup. Freeze 3 hours or until firm. Remove pops from cups just before serving. Look for wooden pop sticks in craft or hobby stores. If you don't have pop sticks, you can use plastic spoons for handles instead.